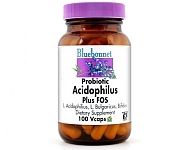 Bluebonnet’s Probiotic Acidophilus Plus FOS Vcaps provide over three billion viable, healthy microorganisms per capsule. This probiotic formula is specially formulated with lactobacillus acidophilus (1 billion), lactobacillus bulgaricus (1 billion), and bifidobacterium (bifidum & longum, 1 billion) in a unique 100 mg base of FOS (fructooligosaccharides). Available in easy-to-swallow vegetable capsules for maximum assimilation and absorption. Free Of: milk, egg, fish, crustacean shellfish, tree nuts, peanuts, wheat, soybeans, corn, yeast, gluten, barley, rice and sodium.